The San Francisco 49ers play at Candlestick Park in San Francisco, California. The 49ers home field is a unique location to experience a National Football League game and a terrific way to enjoy time with friends and family. See the San Francisco 49ers seating chart for a basic layout of the different seating options at Candlestick Park and look through 49ersSeatingChart.com for detailed information and the find cheap San Francisco 49ers tickets for the best 49ers seats. The San Francisco 49ers Candlestick Park is separated into multiple seating options spread throughout all levels of the facility: 49ers Field Boxes, 49ers Red Zone, 49ers Field Suites, 49ers Luxury Suites, 49ers Touchdown Club, 49ers VIP Party Pavilion, 49ers Platinum Seats, 49ers Gold Seats, 49ers Blue Seats, 49ers Light Blue Seats, 49ers Green Seats, 49ers Red Seats, and 49ers Charcoal Seats. The 49ers use an odd combination of descriptions and colors to segment the Candlestick Park seating areas with the best 49ers seats determined by the price paid for a 49ers ticket. San Francisco 49ers tickets are primarily sold through the Candlestick Park box office and the 49ers team website, but the largest selection of 49ers tickets for every NFL home game is available through secondary market ticket websites and ticket brokers. Examine www.49ersSeatingChart.com for the most up-to-date information and pictures from each section before making a costly 49ers ticket purchase. Candlestick Park has been the home turf for the San Francisco 49ers since it opened in 1960. The venue has undergone multiple name changes since its initial construction including 3Com Park at Candlestick Point, San Francisco Stadium at Candlestick Point, and Monster Park. The original name of Candlestick Park is currently used for the entire venue. Candlestick Park was used as a shared facility between the 49ers and the San Francisco Giants of Major League Baseball's National League until the Giants moved into AT&T Park in 2000. 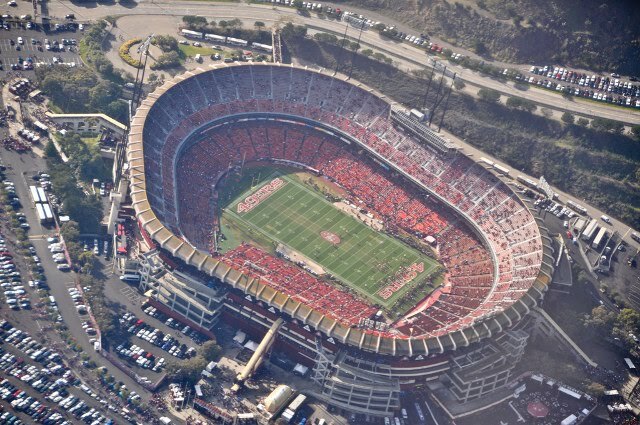 The total capacity of Candlestick Park is 49,732 including luxury suites and semi-private seating boxes. See the Candlestick Park seating chart for additional details concerning the different seating options for 49ers home contests.